Characteristics and personalities of your employees are more important than their skill and knowledge. Even they have skill that you need but characteristics not fit to your company, it is hard for them to assist you in business success. Let’s see what qualities should your employees have to assist you in business success. A confident employee more willing to take risks or go for challenges that an uncertain counterpart would shy from as confident employee believe on themselves that they able to complete the task and overcome challenges. 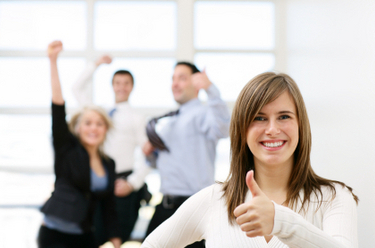 When a confident employee interacts with your customers, they able to increase credibility of your company. All employers love a person who’s willing to do more than what’s required from him, however difficult it may be. But a person who is passionate about his job will not feel like he is working. Thus, he will naturally put in his best because he loves what he does. He also derives happiness from the time spent with his co-workers and superiors. People don’t like to surround with negative energy, negative energy definitely affected our life and work performance. Just like the co-workers, an employer would love to see someone who comes to work with a smile on his face and is always optimistic, whatever the situation. Positive and happy behavior is contagious. Moreover, positive employees seek for solutions when they recognize problems instead of complaining. Self-motivated individuals don’t need to be pushed to get work done. They possess the stamina to perform outstanding work and usually, work hard consistently. You don’t have to worry about slack or lost hours when there’s a self-motivated employee working for you. Self-motivated people know what their purpose is in life, and they live it. Self-managed employee strives to improve himself, reduce his weaknesses and play up his strengths. He will not waste his employer’s precious money and time on distractions such as the cellphone or casual internet browsing. He is also punctual, doesn’t procrastinate or take unnecessary breaks and is conscientious. Employees are the powerful asset for any company. Select the right candidate based on qualities above able to drive your business success.